Untreated oral health issues can wreak havoc on health and well-being, yet medical schools have historically taught little about them. Now, some leaders are determined to change that. Oral health problems can cause horrible pain and great expense. What’s more, research suggests there are connections between an unhealthy mouth and a range of systemic health issues, including stroke, heart disease, preterm labor, and the progression of diabetes. Yet many medical school students have not learned much about identifying dental problems or oral manifestations of systemic disease—or the importance of counseling patients to care for their teeth. In 2009, for example, nearly 70% of responding medical schools offered fewer than five hours of oral health education, according to a study published in Academic Medicine. Now, a handful of medical schools, teaching hospitals, and professional organizations are spearheading efforts to bridge the medical-dental divide. From weaving oral health into existing curricula to partnering with schools of dentistry, medical educators are working to put the mouth back in medicine. 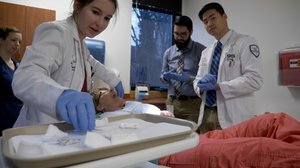 “We hope that when [medical students] start practicing, they won’t just view a patient’s teeth as something that gets in the way when they’re looking at the tonsils,” says Mark Deutchman, MD, a professor at the University of Colorado (CU) School of Medicine and the School of Dental Medicine who cocreated an online oral heath curriculum for medical students. The separation between medicine and dentistry has its roots in Europe hundreds of years ago. In the United States, the establishment of dental schools in the mid-1800s helped solidify the division between oral and overall health, according to a 2016 AMA Journal of Ethics article. Medical educators and practitioners looking to integrate oral health into courses and care can turn to Smiles for Life: A National Oral Health Curriculum. The 11-module curriculum, available for free online, covers topics such as how to perform an oral exam, the oral-systemic health connection, and oral health during pregnancy. Since 2016, schools of medicine, residency programs, private practices, and others have downloaded more than 17,700 Smiles for Life modules, says Anita Glicken, MSW, executive director of the National Interprofessional Initiative on Oral Health, which supports the curriculum. In addition, users completed more than 62,500 Smiles for Life courses for continuing education credit in 2017, she reports. First developed in 2005 by the Society of Teachers of Family Medicine, Smiles for Life has since evolved to meet the needs of varied specialties. Glicken notes that oral health curricula can boost interprofessional collaboration between physicians and dentists and can help medical schools meet ACGME competencies on interprofessional practice. For example, surveyed practitioners indicated that the curriculum increased their likelihood of making a referral to a dentist. This gap between medicine and dentistry means opportunities to detect oral health problems—and related general health concerns—too often go untapped. A significantly larger number of Americans have medical insurance than have dental insurance and many more are likely to visit a physician than a dentist in any given year. That means physicians are well-positioned to identify problems like tooth decay and encourage patients to practice good oral hygiene. Currently, over one in four U.S. adults have untreated tooth decay, and rates among blacks, Hispanics, American Indians, and Alaska Natives are higher than white populations. “So many people end up in the emergency room with preventable dental conditions, many of them children, and the cost is significant,” says Anita Glicken, MSW, executive director of the National Interprofessional Initiative on Oral Health and associate dean and professor emerita of the University of Colorado School of Medicine. There is a “systemic problem in oral healthcare delivery that physicians can help address,” she adds. A healthy mouth is particularly important for people with chronic conditions such as HIV that often cause oral health problems, experts note. Physicians also need to be able to recognize oral signs of health issues, including eating disorders, anemia, and leukemia. In fact, Conklin has been instrumental in developing a groundbreaking curriculum at Carilion that provides oral health education extensively throughout students’ first three years of medical school. In year one, students learn to spot conditions like gum disease and oral cancer and to describe the teeth as they would any other part of the body in their classes. Year two brings an entire week on oral health, including lessons on oral signs of systemic disease and how to collaborate with dentists. In year three, students spend time in a dental clinic as part of their family practice rotations. “We believe with all our heart and soul that if we begin teaching oral health [early on], students will develop a skill set that will become as common for them as listening to the heart and lungs,” he says. At the University of Massachusetts Medical School, educators sprinkle oral health throughout the curriculum. Efforts there began about 10 years ago with a full day between third-year clerkships devoted to oral health. Students heard from dentists and dental hygienists on oral health throughout a person’s lifespan and learned and practiced oral health exam skills. But it was clear that students needed more grounding in oral health basics in order to take advantage of the third-year requirement, says Hugh Silk, MD, MPH, professor of family medicine and community health. So, over the last few years Silk has led efforts to weave oral health throughout the medical school’s curriculum. For example, students now learn how to correctly describe the teeth during anatomy labs, and how HIV impacts the mouth when studying infectious diseases. In addition, students can take a fourth-year elective working alongside dentists and dental hygienists in community settings. 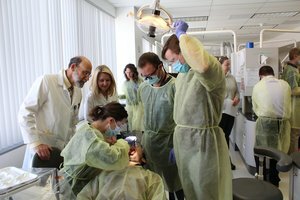 Mark Deutchman, MD, professor of family medicine, and Denise Kassebaum, DDS, dean of the CU School of Dental Medicine, supervise an oral anesthesia training. Silk also works with the two-year-old Center for Integration of Primary Care and Oral Health at the Harvard School of Dental Medicine. The center, which focuses on improving oral health training for primary care providers, is building a repository of oral health education resources. Investigators there currently are pouring over responses to a nationwide survey of medical schools, residency programs, and clinical practices in the hopes of better understanding the current state of oral health integration. Silk says there’s still a long way to go in breaking down the dental and medical silos. But he says that much like increasing recognition of the connection between physical and emotional health, better education can help bridge the gap between the mouth and the rest of the body. One way to bridge the oral-systemic health divide is collaboration between medical and dental schools. At CU, roughly 200 medical students visit the School of Dental Medicine each year for required hands-on practice in performing an oral health exam. Health educators looking for effective ways to teach about dental care can turn to the AAMC's MedEdPORTAL, an online journal of teaching and learning resources. Sponsored by the American Dental Education Association, the MedEdPORTAL’s Dental Education Collection includes hundreds of innovative, collaborative resources developed by leaders in academic dentistry. Topics covered range from dental anatomy to caries management and from applying fluoride varnish to oral care for older adults. “We get a great reaction from students—they immediately recognize the importance of it,” says Deutchman. The CU curriculum, which began about 10 years ago, starts with oral health content provided in the second-year digestion and endocrine block. During year three, all students learn how to detect the signs of gum disease, oral cancer, and childhood tooth decay. They then visit the dental school, where they practice the newly acquired skills under the guidance of dental students. Additionally, about a half dozen medical students each year sign up for a fourth-year oral health elective where they spend two weeks inside a dental clinic. CU recommends that students interested in rural or underserved primary care practice take the elective, which focuses on acute dental problems such as infection and trauma. Another elective covers oral health in children, including how to apply a fluoride varnish. Deutchman says the CU curriculum highlights the real-life interprofessional understanding needed to address oral health gaps. “If physicians ignore the mouth, they’re ignoring a part of the body that impacts the other conditions they’re treating,” he says.